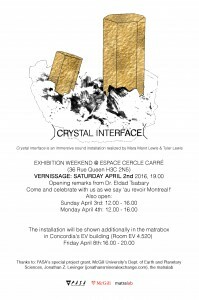 Mara Marxt Lewis and Tyler Lewis will present their installation “CRYSTAL INTERFACE” in the matrabox on Friday April 8, 2016 from 16h to 20h. The installation will also be shown at ESPACE CERCLE CARRÉ at the following times. CRYSTAL INTERFACE is a collaborative sound installation conceptualized and executed by Mara Marxt Lewis and Tyler Lewis. This immersive work is a place for listening, and for physically exploring the visual space created by the artists. A landscape is constructed by combining real geological specimens with fabricated ones, the latter becoming physical sound objects through the use of vibrational transducers. A rhythmic dialogue across a multi-channel audio environment grows out of the sonic interplay between these sculptural entities. Crystals function in both scientific and metaphorical ways, interfacing between the animate and inanimate, the organic and inorganic. Crystal formations may appear lifeless, even as corpses, but they hint at life; its growth and movement. In CRYSTAL INTERFACE the active sound environment becomes the life of the crystals, the individual crystal sound objects forming a compound sonic space.